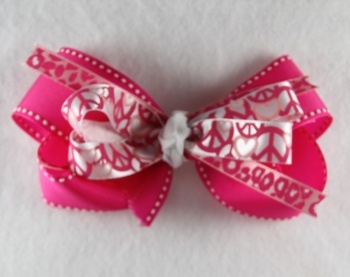 This is a great hot pink bow decorated with pink cheetah prints and pink peace signs. The base bow is hot pink with white dotted moon stitch lines on the borders. There is 2 criss cross layers of the 3/8" hot pink cheetah print in the middle. Topped off with a peace sign white satin ribbon that has hot pink peace signs and light pink hearts all over. The middle is wrapped with a white grosgrain ribbon and it is attached to a French clip. This bow calls all hot pink peace sign and cheetah lovers.